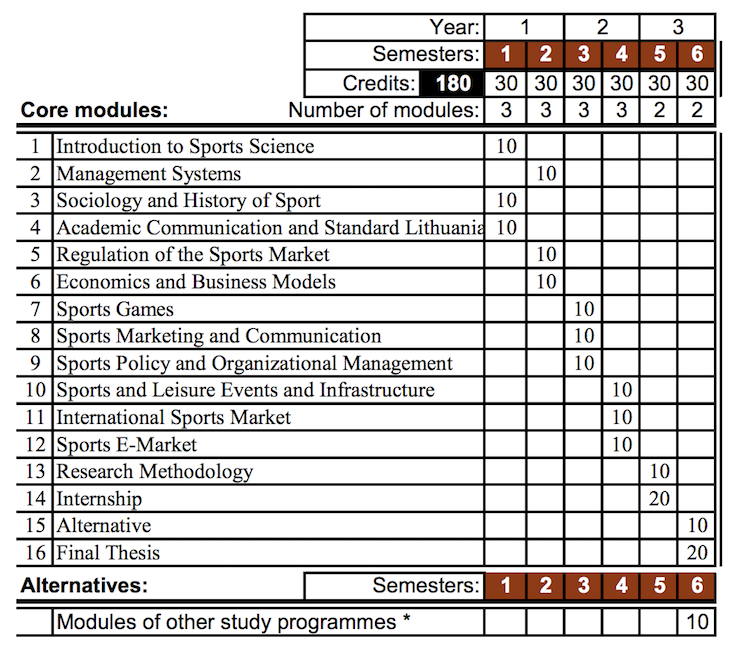 On the basis of achievements in fundamental and applied interdisciplinary science and technology of an international level, to train university level enterprising and socially responsible sports managers, able to work in business, public and state organizations and organize as well as run their own business. Objectives of this study program are to train demonstration of managerial knowledge and skills, management of resources and processes in the sports sector. As well as prepare sports managers to demonstrate entrepreneurship skills in the sports sector and collection, organization and analysis of targeted information also carrying out research. * Choose only the modules of other study programs of the corresponding autumn or spring semester, which do not coincide with other modules of this program according to the schedule. To strive to know different global social, cultural and sports trends. After graduating from this study program, you will be able to build your own business or represent athletes, work as an executive, manager or administrator in national/ foreign sports organizations (associations, federations, clubs). Moreover, graduates have access to the second cycle studies in the field of Business and Management or other programs in the area of Social Sciences in Lithuania and abroad and acquire a Master’s degree.